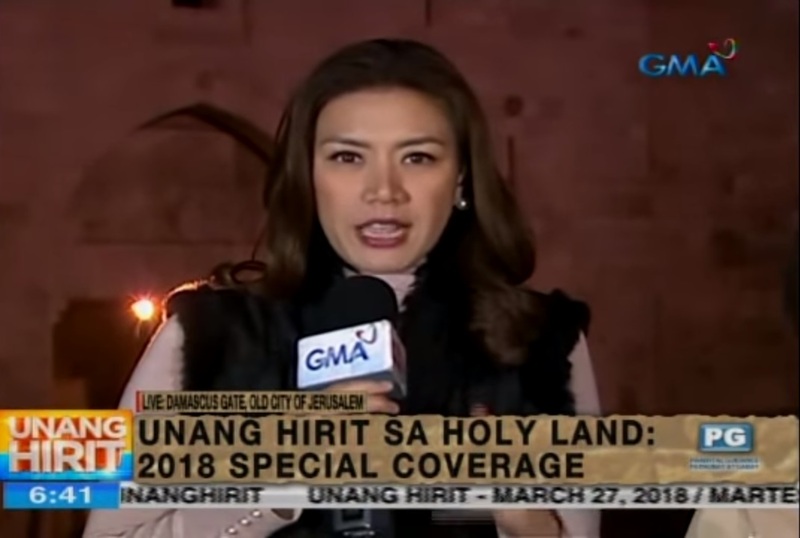 GMA News sent Rhea Santos last week to the Holy Land for a series of special reports this Holy Week. Accompanied by a small team of Unang Hirit staffers, including the show's program manager, Mon Del Rosario Torres, Santos traveled to some well-known holy sites such as Ein Karem, Judea, an ancient village of the Jerusalem district; Mount of Temptation, where Jesus was tempted by the devil; and Church of Nativity in Bethlehem, just to name a few. Describing her experience reporting live from the Holy Land, Santos said: "Iba 'yung nandun ka mismo sa lokasyon ng kapanganakan, o lokasyon kung saan nag-ayuno ang ating Panginoon. Iba 'yung feeling. Parang mas malapit ka sa kanya. Para bang nahahawakan mo siya kahit ba ground na lang'yun, parang nahawakan mo na rin ang Panginoon." Santos will conclude her reporting tonight on 24 Oras. Correction: An earlier version of this story incorrectly stated the position of UH program manager Mon Del Rosario Torres as executive producer.